FILE - Pakistan's Prime Minister Nawaz Sharif speaks at the inauguration of the China Pakistan Economic Corridor port in Gwadar, Pakistan November 13, 2016. Once a key ally in the U.S. war on terrorism, Pakistan finds itself increasingly isolated from Washington amid allegations that it harbors more than a dozen terrorist groups. Instead, it has been steadily cozying up to China and Russia. Both of America’s primary rivals have been taking advantage of Pakistan’s paranoia about India, and gaps in Washington’s global influence as President Donald Trump continues to form his foreign policy in the strategic region. Pakistan’s relations with three of its four neighbors — Afghanistan, India and Iran — are at a low point. And instead of trying to rein in extremism, the government appears to be feeding the growing conservative movement with no sign of backing off a controversial blasphemy law that has led to repeated mob violence. Experts say 13 of the approximately 60 U.S.-designated global terrorist organizations are based in Pakistan, mostly in the tribal region that borders Afghanistan. Major militant groups include the Pakistani Taliban and the Haqqani Network, along with Laskar-e-Jhangvi, Jaish-e-Muhammad and Jundullah. And despite denials that Islamic State has a presence in the country, the terror group has claimed responsibility for recent attacks there. Two U.S. lawmakers introduced legislation last September to designate Pakistan a terror state over its inability to curb homegrown militancy and the threat it poses to its neighbors. Republicans Ted Poe and Dana Rohrabacher accused Pakistan of harboring global terrorist leaders and supporting terror groups, including the Haqqani Network, which targets Afghan and U.S.-led NATO forces in Afghanistan. 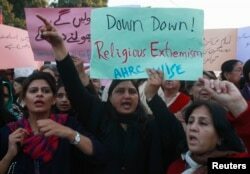 FILE - Women chant slogans condemning Islamist terrorism during an anti-terror rally in Lahore, Pakistan, Jan. 16, 2015. Experts say 13 of the approximately 60 U.S.-designated global terrorist organizations are based in Pakistan. Former U.S. ambassador to Afghanistan and Iraq, Zalmay Khalilzad, said Pakistan should be designated as a state that is sponsoring terrorism. "The Haqqani Network, which is an ally of al-Qaida and Taliban extremists, has operated as Pakistan's proxy," Khalilzad told VOA recently. "If Pakistan refuses to move against the Haqqani Network sanctuaries, the U.S. should consider actions against the sanctuaries, including striking them." Husain Haqqani, Pakistan’s ambassador to the United States in 2008-11 and now director for South and Central Asia at the Hudson Institute in Washington, has advice for Trump. "... for Pakistan, the alliance has been more about securing weapons, economic aid and diplomatic support in its confrontation with India,” Haqqani wrote recently in an op-ed column in The New York Times. “The Bush administration gave Pakistan $12.4 billion in aid, and the Obama administration forked over $21 billion. These incentives did not make Pakistan more amenable to cutting off support for the Afghan Taliban. … Mr. Trump must now consider alternatives,” Haqqani wrote. Pakistan also has done little about the thousands of unregistered Islamic schools known as madrassas, which are linked to an increase in militancy in the Afghan-Pakistan region. The schools nurture militant ideology and are known to provide foot soldiers for the Taliban. FILE - Pakistani religious students attend a lesson at Darul Uloom Haqqania, an Islamic seminary and alma mater of several Taliban leaders, in Akora Khattak, Khyber Pakhtunkhwa province, Sept. 14, 2013. Many Pakistani religious schools, so-called madrassas, are widely seen as breeding grounds of violent extremism. Instead, Pakistan has portrayed itself as a victim of terrorism and a staunch ally in the U.S. campaign. A statement issued after a National Security Committee meeting on Friday in Islamabad said, "No other country in the world has done as much for global safety and security as Pakistan at a huge cost of both men and material." Pakistan's Foreign Office spokesperson Nafees Zakariya said the allegations about the Haqqani network’s presence in tribal areas are mere rhetoric. "This is only aimed at putting the blame of their own failures on Pakistan,” he said. The reality on the ground is different. Just three weeks ago, the most recent drone attack in Hangu, a Pakistani district in Khyber Pakhtunkhwa province, eliminated a Haqqani Network commander. Officials confirmed his identity to local media. Pakistan has repeatedly accused Afghanistan and India of allowing terrorists to use their territory to plot and carry out cross-border attacks. Both countries make nearly identical claims against Pakistan. India blames the Pakistan-based Lashkar-e-Tayyiba group for attacks in 2008 in Mumbai that killed more than 150 people, including six Americans. Afghanistan blames the Haqqani Network for a bombing in Kabul's diplomatic area that killed at least 150 and injured more than 450. 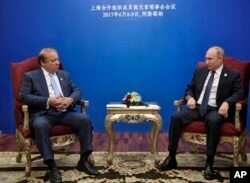 Russian President Vladimir Putin, right, meets with Pakistani Prime Minister Nawaz Sharif after a summit of the Shanghai Cooperation Organization in Astana, Kazakstan, June 9, 2017. Moscow has been been making diplomatic overtures to Islamabad, recently participating in joint naval exercises off Pakistan. At the center of Pakistan’s actions and policies are its fears about India. The two countries have fought three wars, and another is always a threat. Both sides have nuclear arsenals capable of destroying the subcontinent several times over. Last month, the U.S. State Department imposed sanctions on Syed Salahuddin, the Pakistan-based chief of Hizbul Mujahideen, one of the major anti-Indian militant groups fighting in Kashmir, saying he poses "a significant risk of committing, acts of terrorism that threaten the security of U.S. nationals or the national security, foreign policy, or economy of the United States." Islamabad criticized the move and said militants fighting New Delhi’s rule in Kashmir are involved in a “legitimate" struggle for freedom. Relations with Kabul have taken a downturn this year after terror attacks in Pakistan that it claims were at least planned by extremist groups in Afghanistan. Pakistan has closed border crossings for lengthy periods and has begun construction of a border fence with Afghanistan. In May, Tehran warned Islamabad that it would hit bases inside Pakistan if the government does not confront Sunni militants who carry out cross-border attacks. Ten Iranian border guards were killed and one abducted by militants last month. While President Trump has yet to come up with a policy to deal with Pakistan’s worsening quagmire, China has stepped in as part of what appears to be a concerted effort to expand its sphere of influence. It currently is involved in a major mutually beneficial project to build a network of roads and other infrastructure from its territory to Pakistan’s Gwadar port in order to provide a shorter route to the Persian Gulf. Russia, too, has been making diplomatic overtures and recently participated in joint naval exercises off Pakistan. VOA’s Afghan, Urdu and Deewa Services contributed to this article.